Haven’t we all tried to wear shoes that are smaller or bigger than our actual size at any point in life and we badly wished to know how to measure feet for shoes easily and accurately? Wearing inaccurately sized shoes are harmful and can cause harm or injury in many cases. You can easily measure your shoe size at home and it doesn’t require any special types of equipments. After taking the proper measurements to in order to determine how to measure feet for shoes, we can get a proper fit with the help of manufacturer’s size chart. The exact feet size is an essential factor for buying a pair of shoes and if you already know the size of your feet, you can save time at the shoe store and utilize it to find a perfect pair of yourself. It also saves you from the risk and time involved in returning the purchased item. Here’s a step-by-step instruction guide provided to accurately measure your foot size without rushing to any shoe store. You should first wear a pair of socks similar to the one you would wear with the desired shoes. Firstly, you should sit on a chair with one foot firmly placed on the floor. The foot should be adjusted such that the leg is slightly bent in a forward direction and your shin should be right in front of your ankle. 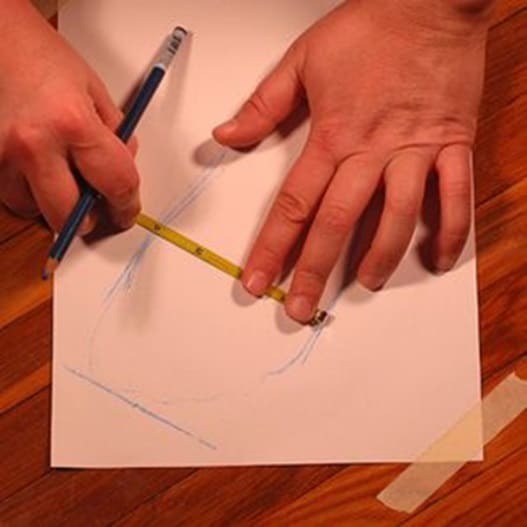 Hold a pencil upright and trace an outline of your foot on the sheet of paper. 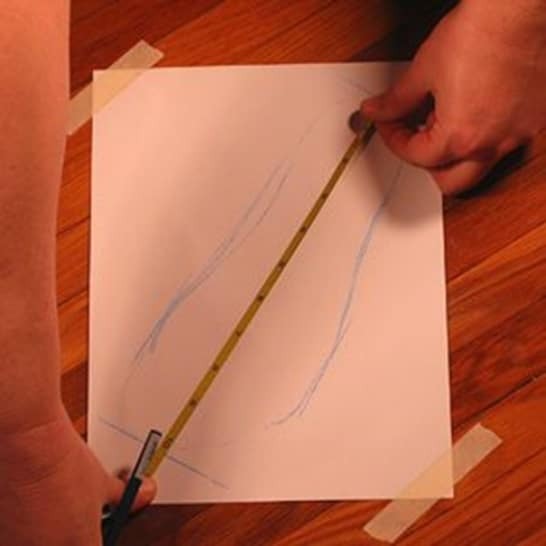 The pencil should be perpendicular to the floor and not at any other angle to avoid tracing the outline under your foot for an accurate finding of how to measure feet for shoes. Also, the pencil should be aligned snugly against your foot while tracing. 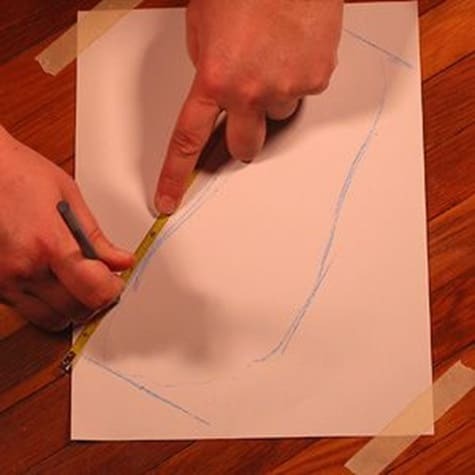 If required, you may ask someone else to help you with the tracing but this can be easily done on your own. After tracing is done, it is time for some accurate measurements for the determination of how to measure feet for shoes. It is advisable to trace and measure both your feet as there may be differences in length and width between your feet. Rarely, it may be half or whole of the shoe size. You can use a pencil to mark the widest parts as well as the longest parts of your feet from the tip of the longest toe to the heel. You can measure the length using a ruler or measuring tape. Use the closest mark on your ruler and avoid rounding up or down too drastically. For example, in case of inches, use the closest 16th mark. Note down the measurements and then repeat the same process for the other foot. The more accurate measurements will determine the proper size of the shoes. Many people assume that the correct shoe size can be determined with the help of the length of the feet only. But the width is also an important parameter to determine how to measure feet for shoes. Widths may actually vary very slightly from one size to another and so people safely consider the length of the foot to be the only consideration for actual shoe size. The width of the feet can help you to find a comfortable pair of footwear. Some people have narrow feet while others may have wide ones. This is where the width of the feet comes into play to learn how to measure feet for shoes. The width of the shoe is usually denoted by a letter, mentioned after the size of the shoe. There are different width marking for men and women just like sizes of the shoes. Similar to the measurement of the length of the foot, you can measure the widest part of your foot using a ruler and use the closest mark on the scale that is possible. For inches, you can use the closest 16th mark. Note down the measurement and repeat the same process for the other foot. It is always advisable to use the largest of each measurement for determining your exact shoe size. For example, if you found that your left foot is slightly longer, then use the length of the left foot as the length or if you found that the right foot is slightly wider, then use the measurement of the right foot as the width. However, in certain cases, these measurements may not be accurate and you can always visit a shoe store to get your proper measurements done by a professional. Always keep in mind that our feet are three dimensional rather than two dimensional but the size charts provide information and take into account only two out of the three dimensions. So, it is always the best to wear and try the shoes before you finalize to buy the particular product. According to the American Orthopaedic Foot and Ankle Society, Almost 88% of women in The United States wear shoes that are smaller than their feet regularly and almost 77% of men wear shoes that are not their correct size regularly. Wearing the perfect shoe is absolutely necessary in order to avoid certain health risks like diabetic foot ulcers, athlete’s foot, bunions, corns, hammer toes, heel spurs etc. So it is absolutely necessary to wear the right kind of shoes to maintain a healthy life. There are many benefits of buying shoes online which brings a variety of shoes like wide width shoes, doctor sandals for orthopaedic patients etc. Without knowing how to measure feet for shoes it becomes difficult to order the perfect pair of shoes for yourself. An alternative to this process is by using a Brannock Device which is a foot measuring device available in almost all footwear stores. It is a specialized process which gives accurate results of your feet size. You need to position your foot on the device, measure the lengths from the readings provided on the device and measure the width using the movable width bar. There are usually two measurements concerned with the length of the foot- Heel-to-Toe measurement and Arch measurement and consider the one which is larger than the other. Don’t worry if you have no access to any professional shoe fitter, you can still learn how to measure feet for shoes using this article. Hope you have enjoyed reading the article and you have learned new things for your next shoe venture. Don’t forget to leave your valuable comments and share with your friends and family if you like it and would like to recommend this article to others. So, if you are planning to buy a perfect pair of shoes in near future and without accessing the Brannock Device, you need to take accurate measurements of your feet, you can quickly refer this article which gives you a detailed insight into how to measure feet for shoes at the comfort of your own house with the help of simple requirements and it also makes sure that you have a comfortable journey with your footwear for the rest of your life.